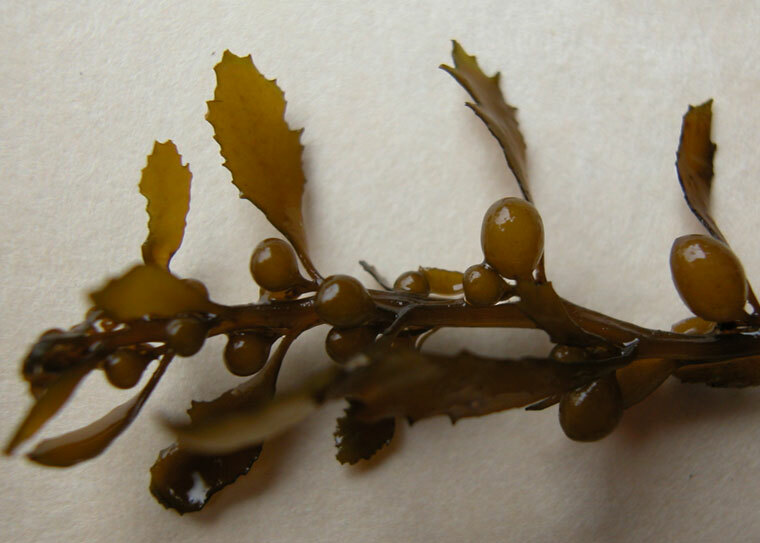 Sargassum muticum is a large, yellowish-brown or olive-brown seaweed that can be distinguished from most other Pacific coast seaweeds by its small, spherical float bladders. It grows on rocks, shells or other hard objects, attached by a stout, spongy holdfast. The lowest part of the stalk just above the holdfast is sometimes divided into a few main stems, and gives off several flat, blade-like leaves up to 10 cm long. Above that, the main stems branch repeatedly to form a bushy plant that is often 1-2 m long, with a maximum length of about 10 m. The branches bear small leaves, club-shaped reproductive bodies, and the spherical float bladders. The leaves are up to 2 cm long and either smooth-edged or toothed (the latter resembling small holly leaves). The reproductive bodies are about 1 cm long and 1-2 mm in diameter. The float bladders are gas-filled spheres up to 3 mm in diameter, borne on short stalks, and occurring either singly or in clusters. In the northern (British Columbia) and southern (Baja California) portions of its Pacific Coast range, Sargassum muticum only grows down to about 2 m depth, and it is restricted to low intertidal and shallow subtidal sites in San Francisco Bay. In southern California, however, it is abundant at 4-8 m depth and has been found at depths up to 24 m, although Nicholson et al. (1981) reported that plants found deeper than 15 m are attached to small rocks and have collapsed float bladders, and may have been carried by water currents out of their normal depths. In England it occurs from the lower intertidal to 6-8 m, and has been collected as deep as 25 m in France. It grows on rocks, floating docks, oyster shells, slipper shells, sea squirts and a variety of seaweeds, and is often found in conspicuous stands, or cast up on shore. Sargassum muticum is usually restricted to sheltered waters, but on the Pacific Coast it occurs on the open coast at Cape Arago, Oregon and the Palos Verdes Peninsula in southern California, and in a highly wave-exposed site at Punta Quebrada in Baja California. Sargassum muticum can grow in salinities of 7-34 parts per thousand and temperatures of 10-30 ° C. One laboratory study reported that it grows faster at higher temperatures up to 25° C, but another found that the rate of photosynthesis peaked at 15-20° C and juvenile growth at 20° C.Sargassum muticum typically grows up to 1-2 m long in Japan, 3-4 m long in the Mediterranean Sea, and up to 10 m long in Atlantic France. On the Pacific Coast, plants grow up to about 2 m long in northern Washington and British Columbia, but in southern California a large plant can be 3-4 m long and plants up to 10 m long have been reported. Sargassum muticum reproduces during the summer in the northern part and year-round in the southern part of its Pacific Coast range. The reproductive bodies, containing both male and female reproductive organs, grow near the outer ends of the branches in the middle part of the plant. Sargassum muticum is capable of self fertilizing. A plant 2 m tall can produce 100 million-1 billion embryos, which in the laboratory will attach to an object within a few minutes after being released. Some embryos are released while the branches are still attached to the plant; others remain in the reproductive bodies while the branches break off and, buoyed by the float bladders, disperse in currents and by wind drift. These branches can survive afloat for up to 3 months, and can initiate new populations. Nicholson et al. (1981) reported on a possible short-distance dispersal mechanism they called "walking Sargassum," in which entire plants attached to fist-sized rocks drift with the currents and sink to the bottom where the water slows. There are many reports of Sargassum muticumcompeting with and displacing native species of seaweed and eelgrass, at least in part by shading and reduction of light levels. In Britain it has become the dominant low intertidal species at some sites where it out-competes Cystoseira and Laminaria seaweeds (Danek 1984), displaces the seaweed Halidrys siliquosa as the dominant species in deeper water (Eno et al. 1997), and grows over eel grass beds in the Isles of Scilly. It has displaced the seaweed Laminaria saccharina and the eelgrass Zostera marina on the French Atlantic coast, and competes with native seaweeds in the Venice Lagoon. In some British Columbia sites it may be competing with seaweeds and replacing the native eelgrass Zostera marina (Druehl 1973). At Santa Catalina Island in southern California, it appears to have taken over large shallow beds of the seaweed Scytosiphon (Nicholson et al. 1981). It may also exclude native species by occupying areas when they become temporarily vacant, as was reported following a die-back of the kelp Macrocystis pyrifera at Santa Catalina Island, and for eelgrass die-backs in Atlantic France (Den Hartog 1997). On the other hand, Silva (1979) states that "there is no evidence that Sargassum muticum is displacing the native biota of San Francisco Bay." Few organisms have been found living on Sargassum muticum in British Columbia, though a number have been reported in Washington, Oregon and California. A study in southern California estimated that a 5 m tall plant hosts an average of 3,000 animals, including foraminifers, hydroids, flatworms, polychaete worms, leeches, snails, ostracods, cumaceans, isopods, gammarid and caprellid amphipods, opossum shrimp, euphausid shrimp, crabs and bryozoans (Nicholson et al. 1981); while a study in southern England found 80 animal species, 52 seaweed species and 9 fungi living on or attached to Sargassum muticum (Withers et al. 1975), including some small tube-building worms that may have been introduced with it. Other impacts from Sargassum muticum include the fouling of propellers and fishing lines, and of waterways and marinas when it becomes detached and forms large floating mats. It is also a pest on oyster beds and a nuisance to commercial fishermen, fouling their nets. In southern England, a vigorous effort was made to eradicate Sargassum muticum immediately after its discovery, pulling it by hand and using tractors with attached harrows, loaders and other equipment. Over 480 tons were removed between 1973 and 1976, before the effort was abandoned. Most of the infested areas were successfully cleared each year, but this was almost invariably followed by heavy settlement and regrowth in the following year (Gray & Jones 1977). An effort was also made to eradicate it in Ireland. Methods such as trawling, cutting and suction have been unsuccessful, as have herbicide applications, which required large doses and were unselective, killing other seaweeds as well. Sargassum muticum's small, spherical float bladders distinguish it from most other Pacific coast seaweeds. It is most likely to be confused with a few native species in the genus Sargassum and the related genus Cystoseira. There are two species of Sargassum that range from southern California around the latitude of Los Angeles to around the southern border of Baja California Norte. 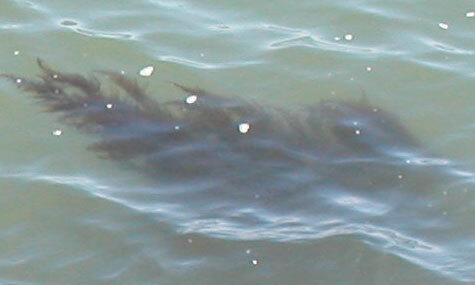 Both grow to no more than a meter in length, and often are less than half that long. Sargassum agardhianum generally resembles Sargassum muticum, but can be distinguished by the presence of a sharp point on the end of each of its small, spherical float bladders. Sargassum palmeri, which occurs on offshore islands from Santa Catalina Island southward, has float bladders that are smooth and round like those of Sargassum muticum, but larger (3.5-6 mm in diameter compared to ≤3 mm) and borne on longer stalks. Its lower branches are more or less spiny, and its leaves are narrow, strap-like and repeatedly branched. Sargassum muticum is probably present at many Pacific Coast sites other than those listed above. In Puget Sound, it occurs in the San Juan Islands and several sites in the South Sound. 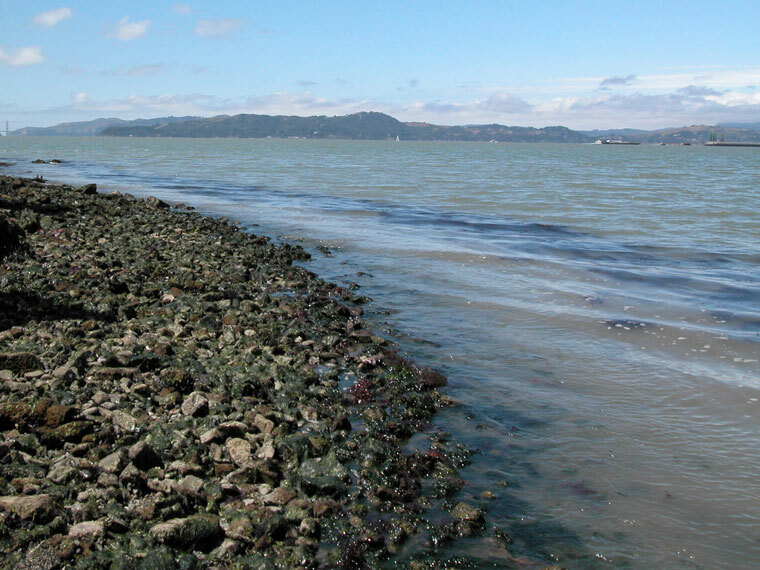 In Humboldt Bay, it has been collected from riprap near the mouth of the bay to brackish water in Elk River, and in Arcata Bay. In San Francisco Bay, it is found from the pilings of the Golden Gate Bridge upstream as far as The Sisters islands, and on the east bay at least from north of Keller Beach in Richmond to the Fruitvale Bridge in Oakland. 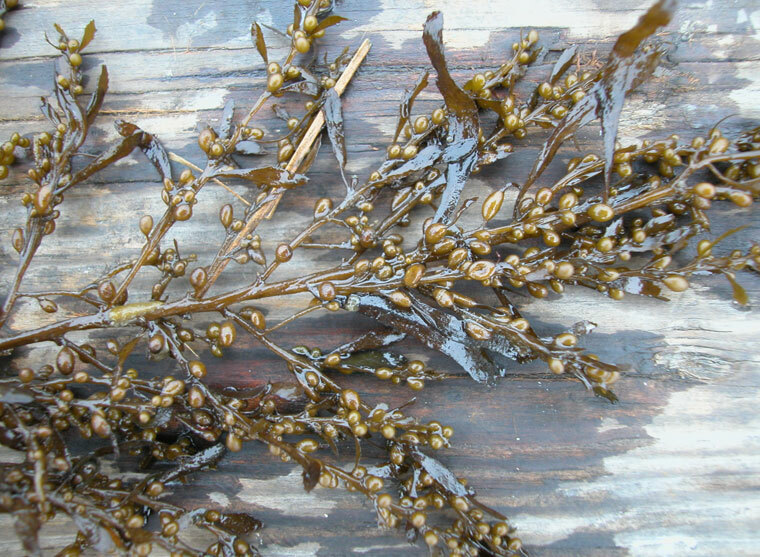 In many of the regions listed above, Sargassum muticum was initially collected in oyster growing areas that had been planted with oyster spat (Crassostrea gigas) from Japan, including sites in Alaska, British Columbia, Washington and Oregon. 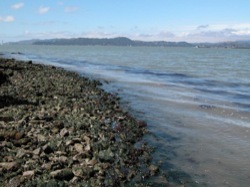 Later spread between bays may have occurred with transfers of oysters, including plantings of Japanese oysters in Humboldt Bay that began in 1953, at Santa Catalina Island in the 1960s, and at Estero de Punta Banda some time before the mid-1970s which preceded the discovery of Sargassum muticum at these sites. Spread between bays could also have occurred with transfers of clams, as fouling on boat hulls or plant fragments entangled in nets or other equipment, or as drifting plant fragments carried in currents. England [collected in 1971], Wales [collected in 1983], Ireland [reported in 1994], Sweden [reported in 1988], Norway, Denmark [collected in 1985], Netherlands [reported in 1982], Belgium, Atlantic France [observed in 1974], Spain [collected in 1985], Portugal, the Thau Lagoon on the Mediterranean coast of France [reported in 1983], the Venice Lagoon in Italy. The initial introduction to Europe in southern England is thought to have resulted from the importing of Japanese oyster stock (Crassostrea gigas) from British Columbia, a consequence predicted by Druehl (1973). Its subsequent appearance in France is also attributed to oyster imports, from either Japan, British Columbia or southern England, though it could possibly have arrived as drifting fragments or fouling on boats. Oysters transplanted from the Atlantic coast of France brought it to the Thau Lagoon in Mediterranean France, and shellfish transplants probably also transported it to the Venice Lagoon. Spread in Europe that is not attributable to shellfish transplants may have occurred by transport of fouling or by drifting plant fragments. Whatever the transport mechanism, with both male and female reproductive organs capable of self fertilization contained in the same reproductive body, only a small fertile fragment of Sargassum muticum is needed to establish a population. Cohen, A.N. and J.T. Carlton. 1995. Nonindigenous Aquatic Species in a United States Estuary: A Case Study of the Biological Invasions of the San Francisco Bay and Delta. U.S. Fish and Wildlife Service, Washington, DC (pp. 10-11). Danek, S.L. 1984. The growth and distribution of Sargassum muticum (Yendo) Fensholt in San Francisco Bay. M.A. thesis, San Francisco State University, San Francisco, CA. Den Hartog, C. 1997. Is Sargassum muticum a threat to eelgrass beds? Aquatic Botany 58: 37-41. Druehl, L.D. 1973. Marine transplantations. Science 179: 12. Eno, N.C., R.A. Clark and W.G. Sanderson (eds.). 1997. Non-native marine species in British waters: a review and directory. Joint Nature Conservation Committee, Peterborough, UK. Gray, P.W.G. and E.B.G. Jones. 1977. The attempted clearance of Sargassum muticum from Britain. Environmental Conservation 4(4): 303-308. Nicholson, N., H. Hosmer, K. Bird, L. Hart, W. Sandlin, C. Shoemaker and C. Sloan. 1981. 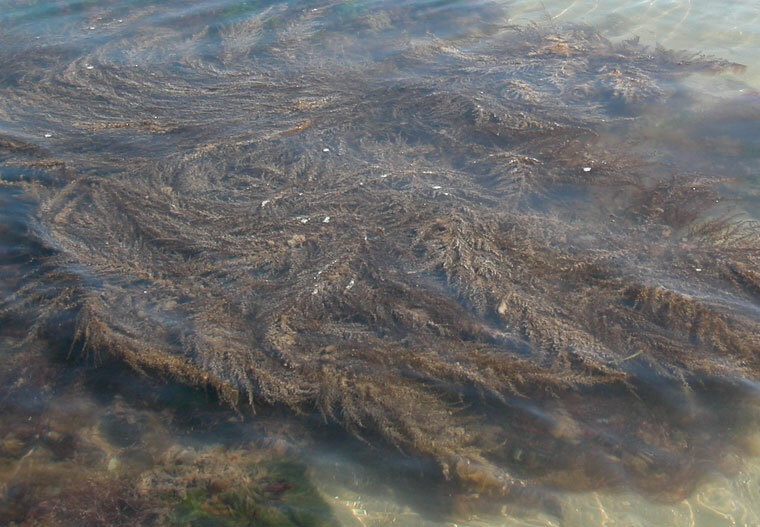 The biology of Sargassum muticum (Yendo) Fensholt at Santa Catalina Island, California. Proceedings of the 8th International Seaweed Symposium, pp. 416-424. Silva, P.C. 1979. The benthic algal flora of central San Francisco Bay. Pages 287-346 in: San Francisco Bay: The Urbanized Estuary, T.J. Conomos (ed. ), Pacific Division of the American Association for the Advancement of Science, San Francisco, CA (pp. 338-339). Withers, R.G., W.F. Farnham, S. Lewey, N.A. Jephson, J.M. Haythorn and P.W.G. Gray. 1975. The epibionts of Sargassum muticum in British waters. Marine Biology 31: 79-86. Sargassum muticum from San Francisco Bay. 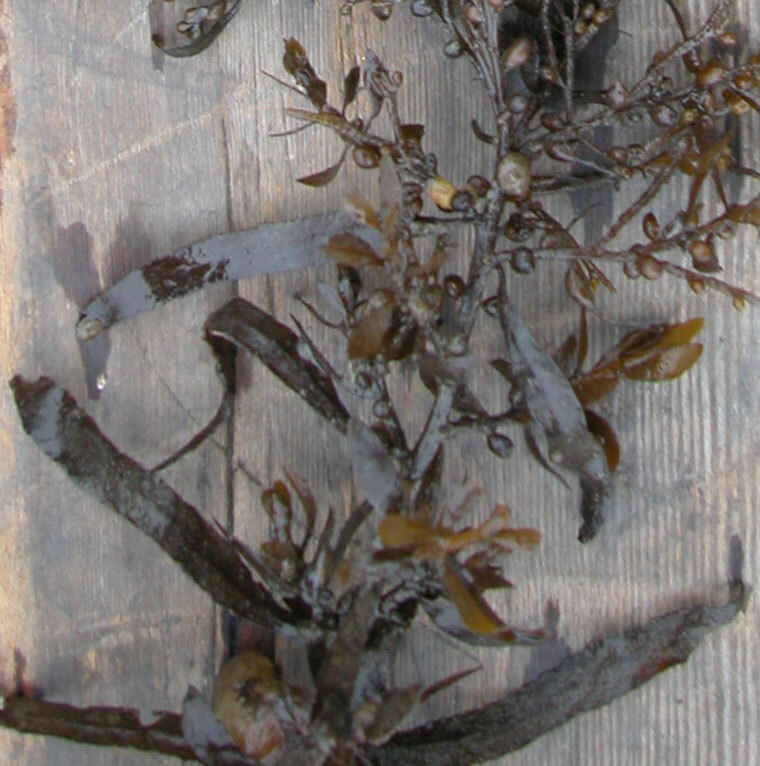 Lower portion of a Sargassum muticum plant from San Francisco Bay, showing the long, blade-like leaves in this part of the plant. 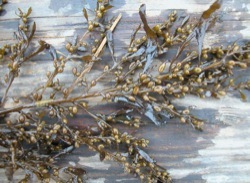 Upper branch of a Sargassum muticum plant from San Francisco Bay, showing float bladders and leaves with toothed edges. Sargassum muticum attached to rocks on sandy bottom in San Francisco Bay. Sargassum muticum in San Francisco Bay. East shore of San Francisco Bay. The dark band in shallow water a few feet out from shore is Sargassum muticum, growing within a narrow depth range.